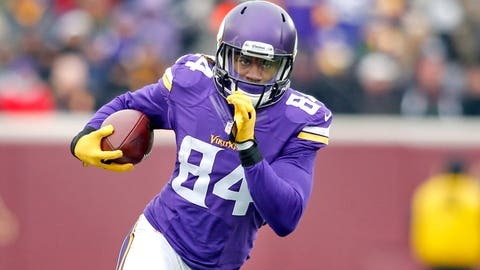 Vikings kick returner Cordarrelle Patterson wasn't about to let a 35-0 deficit get him down. The Minnesota Vikings were trailing 35-0 during the second half of their 38-7 loss to the Seattle Seahawks on Sunday, but that didn’t stop Cordarrelle Patterson from hamming it up as he finally got the Vikings on the scoreboard. With 48 seconds left in the third quarter, Patterson returned a kickoff 101 yards for a touchdown and held the ball in the air for the last 30 yards. As he neared the goal line, he "Prime-Timed," high-stepping with one hand behind his head, then jumped into a section of the stands at TCF Bank Stadium where Vikings fans were still hanging around as their team got throttled.